Campaigners have applied to English Heritage to obtain listed status for a scaffolding structure which stands at the entrance to Britain's largest illegal travellers' site. The structure which is festooned with protest banners and flags was erected around 2006. 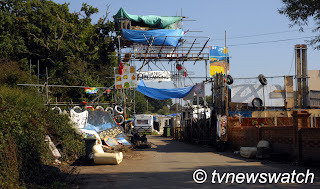 The campaigners claim the scaffolding structure is an "emblem of a struggle for traveller rights". English Heritage has not commented on the application. On Wednesday it was also revealed that two Dale Farm protesters have been charged in connection with an incident at Basildon Council offices. The men, aged 22 and 29, have both been charged with using threatening words or behaviour to cause harassment alarm or distress following Tuesday's incident. They were bailed to appear at Basildon Magistrates' Court on 6th October [BBC]. While the clearance of the Dale Farm site had been due to begin on Monday September 19th it has been delayed by an injunction preventing bailiffs moving in. On Friday Basildon Council attempted to appeal the injunction, however a decision was delayed until Monday this week. After a day of legal arguments Justice Edwards-Stuart extended the temporary injunction preventing Basildon council from clearing the site until a separate hearing examining a potential judicial review of the decision takes place on Thursday 29th September. But even if the council wins that case, it will be prevented from carrying out work on much of the site until another hearing on Monday 2nd October, which will examine the enforcement notices. Speaking outside the court on Monday a visibly frustrated councillor Tony Ball said, "What we've seen today is the wheels of justice grinding slowly forward, but I would like to say it's been a good day for Basildon's residents and for the majority of people who support the council's stance on this issue." Directing comments to residents of Crays Hill who live close to the site he said, "The message I can give to them, is that we are getting there." [Sky News]. Local Conservative MP Mr Baron also spoke of his optimism that the site clearance would take place soon. "The judge made clear that the enforcement notices are valid - its been to the highest court in the land," Baron told the BBC, "The bottom line is, this site clearance will take place." Residents were less than optimistic however. Breaking their silence for fear of reprisals, some said they were themselves willing to break planning regulations if the situation was not resolved soon [BBC]. On Wednesday the site was quiet with only a lone camera-shy campaigner on the front gate. In the field adjacent there was little activity with only few bailiffs patrolling the vast compound. The media presence was also much diminished with only a single satellite truck parked up. Update: On Thursday it was reported that the bid to obtain listed status for the scaffolding structure was rejected by English Heritage [Sky News].